Hyderabad: The country’s GDP would easily go up to 9% from the present 7.5%, if the government implements reforms such as Goods and Services Tax, said Adi Godrej, chairman of the Godrej Group. “We could easily bring the GDP from 7.5% to 9% by enacting Goods and Services Tax. The day we enact this, rates will rise by 1.5-2%. Likewise, there are many other reforms that could have been implemented," Godrej told reporters on the sidelines of function at Indian School of Business here. Replying to a query, he said, the ongoing anti-corruption movement, slowdown in government and Parliaments’ decision-making have definitely affected the business interests. “I hope, our politicians will sit together and government works out with the opposition and implement these reforms. The new manufacturing policy should have been notified and FDIs not just in modern retail only, other sectors also, telecom can be also expanded," Godrej said. He said, the rupee started appreciating soon after the RBI announced the policy. “I think, we should have defended the rupee much better, both in terms of statements made and also physically," he added. On the proposed QIP plans from Godrej Properties, he said, they have plans to raise ₹ 750 crore investment, as the company is growing much faster and needed investments. He said, as per the SEBI norms, the promoters’ stake in the company should be brought down to 75% from the present 83% by 2013. “There are two ways to do it. Either the promoter can sell their share to someone or you can raise more capital in the company so that promoter’s stake comes down. We prefer to do the latter. 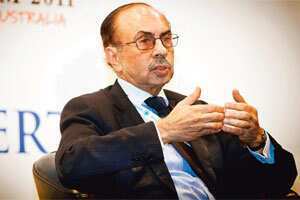 Because the company is growing, we have time till the middle of 2013," Godrej explained. According to him, the percentage stake dilution will depend on company valuation at the time of selling stake. Currently, Godrej Properties’ valuation stood at slightly less than ₹ 5,000 crore.